If you're reading a review you should expect to hear some spoilers. I try to keep them to a minimum though. 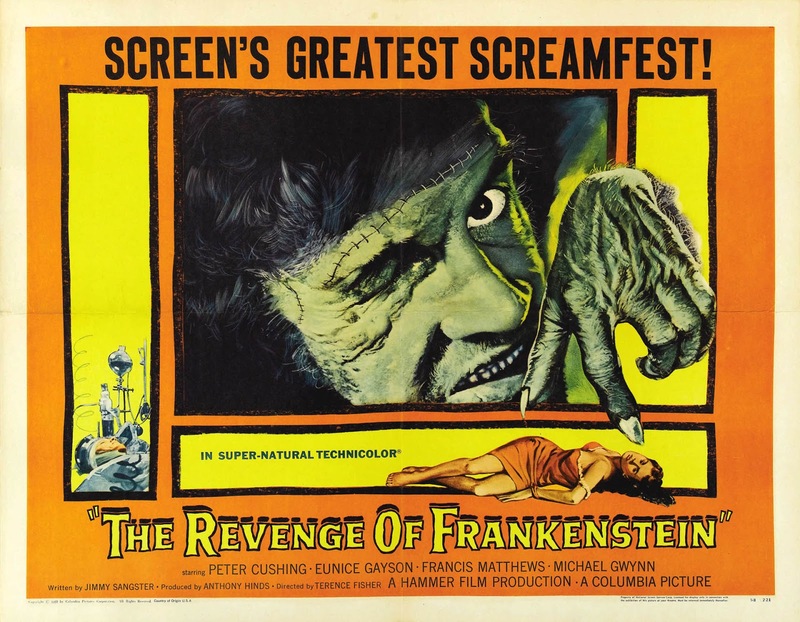 The Revenge of Frankenstein (1958) continues Hammer's Frankenstein series and doesn't do much else. 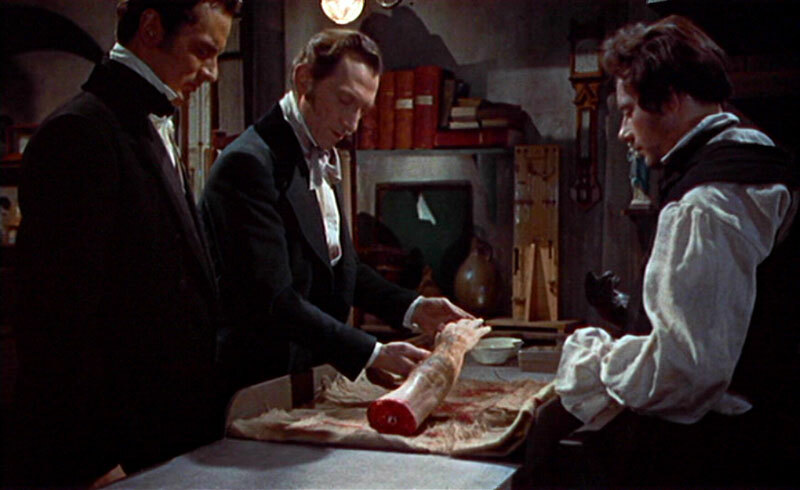 Victor Frankenstein escapes the sentence he's given at the end of "Curse" and sets up a practice in a new village. He becomes very popular with the ladies of the town and uses them to regain his fortune. He also works with the poor and steals their body parts under the pretense of helping them. He is approached by a man who knows his past, but is willing not to mention it if Victor shows him the secret of creating life. Together, they assemble a new, more perfect creation! I think I made it sound way more exciting than it is. For a revenge movie there's not much revenge. The best they offer is it is Frankenstein's revenge against the medical world. Weak. Classism is an issue that this movie glosses over a few times. And why does everyone suddenly know about the monster? The whole frame story of the first film revolved around no one believing in the monster. Seriously, no 'good guy' in this. The closest is Karl at the start. but even then he's too weak willed. Margaret is there to look pretty and scream. There is a character named Fritz, presumably as a callback to the Universal series. The Mob makes a brief appearance and are motivated by blind baseless hatred much like the Universal film. Carl springs from the Universal tradition of handicapped henchmen. He follows a similar path as Ygor, but without getting to be a mastermind in his own right. He draws the most sympathy and is the most touching part of this movie. 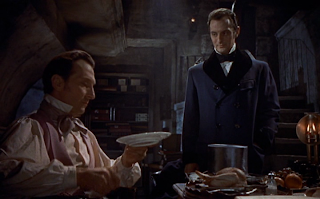 Han Kleve is Victor's assistant. he is suave, sophisticated and cocky. He isn't so much a bad guy as he is an arrogant fool. He is willing to forgive Victor's crimes in order to work with him. Victor just kind of goes along with his work His desire to prove his theory is still strong in this, but he play it much smarter. Unfortunately, his caution and cleverness make this film much less fun to watch than the first. Peter Cushing still gives a great performance with a lot of nuance. I was really hoping to see Victor obsessed with getting revenge on Paul and Elizabeth, but this movie takes it a different route. This was filmed alongside Hammer's Dracula and benefits from using many of the same sets. The larger budget makes everything more real and interesting to look at. An interesting ending an not one that I expected. Vindication for Victor. No real thrills or scares though. The lesson of this film: Brain damage turns you into a bloodthirsty cannibal. The biggest problem with this film is its lack of solid story. It has no plot driving it forward, other than "will Victor be discovered?" It doesn't even have a proper monster. Any tension that is brought up in the Karl story get dealt with quickly. I'd say skip this one. Be sure to see DC's excellent array of film reviews! I am an English teacher and writer from Southern California. I enjoy various forms of media including audio plays, comics, movies, novels, and television. I have a particular interest in Science Fiction. I hope you enjoy my blog.